NcStar VISM double carbine case is a great range bag for any tactical or practical purpose. Lots of padding, lots of pockets, and lots of straps to ensure your gear stays stable and secure. Heavy double-zipper body allows for locks to be applied for transport and the thick material ensures long lasting durability. - 36" Double Carbine Case is constructed of heavy duty PVC material, and protects up to 2 carbine sized rifles. - The primary compartment will accommodate 2 rifles 35 inches in overall length with a thick padded center divider and 4 hook and loop straps to properly secure each rifle. - The secondary compartment is loaded with pockets to store extras such as handguns, optics, cleaning supplies, log books, etc. - The three exterior pockets are perfect for keeping your magazines and ammo organized. - Extra PALS looping on each end allows you to customize your case for your specific needs. 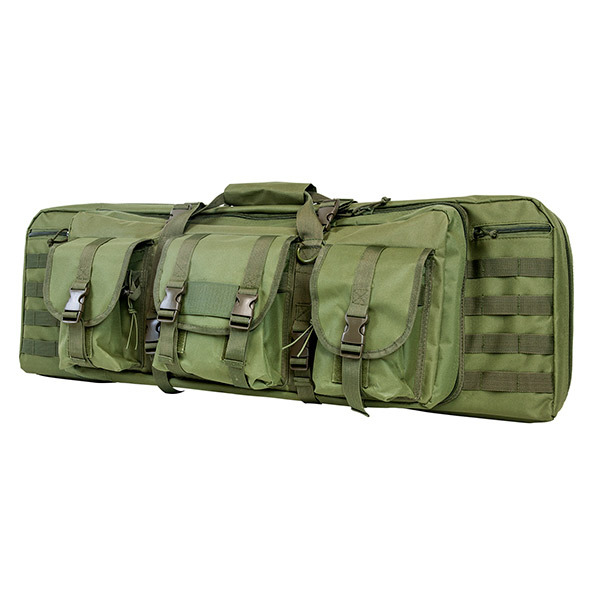 - Two adjustable shoulder straps with an adjustable sternum strap allow you to carry the rifle case like a backpack. - All pockets feature Heavy Duty zippers with pull cords for fast and easy access. - Wrap around carry handle straps and top and bottom compression straps.